So you're saying you'd pay $2K if the IC was included? Asking price is high, imo. They were made to signal to ancient aliens as to where to land their spacecraft. 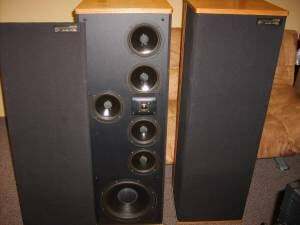 800i's for sale for $100 Not sure if these are vintage but they look nice. Wonder how these would compare to my Boston Acoustic VR30's? Maybe I should upgrade? A much sought after MW6511! Monitor 10's $150 bucks no affiliation. Just realize that is not an original, it is a replacement. Still good but they look a bit different. Yep agreed. Best to replace them as matched pairs. LS 50's for $179 bucks! No affiliation. Ok guys what is a good price on a set of 3.1TL's??? Saw those. Nice looking TL model. Go audition them that way you can check details. If you play your cards right you may be able to get them for $500. Don't know how these sound compared to 1.2 or 2.3's but should be quite good. Didn't want to step on anybody's toes (@kmeek). The guy isn't budging yet on the price. @codycatalist offered to take a look at them for me. They're 3600 miles away from me so Iogistics are a bit..! I have a set of 3.1's. From what I understand they are much rarer of SDA speakers of the SDA line. That being said if I were to put mine out three I'd ask $850 and be firm on my price. But I have a full set of larry's rings to install and I replaced the tweeters too. Then again SDA's don't come up that often here in South Carolina. It is Monterrey, not some chump website full of supposed know it alls. my comment was not aimed at you it was for @verb and @FestYboy. And was a joke something you know very little about evidently. If you do not like this website feel free to find the door nobody is forcing you to stay. I read where it was at and my comprehension of the subject may be a little better than yours. Ever since you started posting again you have belittled and talked down to well respected members who are leap years ahead of your knowledge. No one here will hold it against you bud. That's why we post here. I'm pretty sure they come up for sale here even less often then in South Carolina. Having said that now, there is actually a pair of SDA 2A/B's( the owner really doesn't know which they are and I haven't seen them yet) on CL but they're still 400 miles away. I'm stalking those 3.1TL's in Phoenix at the moment and they're 3600 miles away. The 3.1TL's have me excited, if I can get the shipping logistics worked out then with upgrades I think they'd be worth the money and efforts. What website would that be? 1Cs in this area!?! Cool. 1C's in the Seattle area. Look nice and just serviced by his speaker guy (inductor oil change...). Are those early 1C's? Interesting IC interface. @f1nut are you cleaning house?